Any horse could use the cap not only to protect the ears from cold, but also to protect from flies and horseflies, hot sun, loud noises and screams. To connect the lugs on the horse and you can yourself, it is only necessary to allocate time for this and learn to wield a crochet hook or knitting needles. Select thread crochet hook of appropriate size. For summer caps buy shiny cotton thread or synthetic. In the winter make warm acrylic lugs. 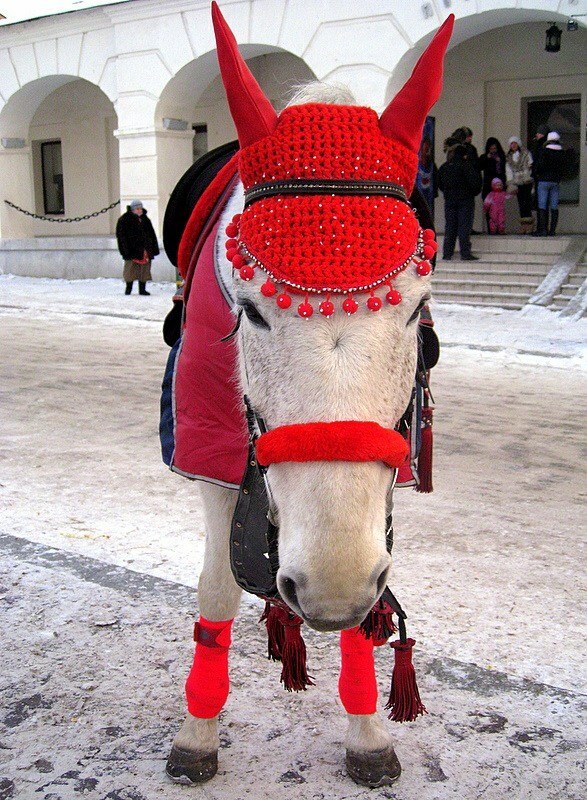 Note that the animal often sweating, so a knitted beanie for a horse needs to survive more than one wash (especially bright shades). To communicate ears, you will need some knowledge of notation. Learn how to knit columns with nakida, columns without nakida, air loop and magnificent columns. Measure the distance between the outer edges of the ears and dial the number of loops corresponding to this distance (previously on the sample to measure the number of loops in one centimeter). Knit columns with nakida several series that came out about 5 – 6 cm For decorating add the number with a fluffy column. For a summer hat will fit delicate patterns, and for the winter prefer dense binding. Tie the triangle or the semicircle, in this case measure the distance to a horse's eyes so as not to make it too long (otherwise it will go into the eye and interfere). Here also pick up a fishnet, or a tight pattern, depending on your desire. Sew both parts together on the reverse side that was not visible seam. First sew the part that will be between the ears, sure that she was at the center of the first part. Then to the ends of the first did sew the horizontal part of the second (not the ends!) so that the corners match. Decorate the cap with fringe along the front edge of the triangle, but don't make it too long, so she did not climb in eyes. Tie lugs. To do this, measure the length and width of ears, dial the number of loops corresponding to the scope of the ear or the length of the hole obtained in the cap. Knit in a circle, gradually reducing the number of loops. It is very important to associate the second ear in the same way, so write down how many loops in a row you cut. If you tie neatly not, just sew these items from fabric. Sew them onto the hat. Tie the strips and sew them at the junction of the two parts, tie them under the horses neck so that the cap does not fall off.